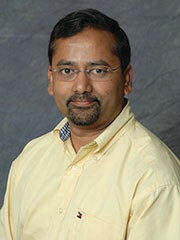 Sohel Anwar, an associate professor of mechanical engineering and principal investigator for NSF award for a pilot program to support the nation’s capacity to out-innovate the rest of the world, says a new design track in the master’s program in mechanical engineering at IUPUI will accomplish that goal. The National Science Foundation has awarded $452,958 to the School of Engineering and Technology at Indiana University-Purdue University Indianapolis to pilot such a program that will prepare graduate-level engineering students to support the nation’s capacity to out-innovate, out-create and out-think the rest of the world. The new design track in the master’s program in mechanical engineering at IUPUI will accomplish that goal by improving students’ creativity and problem-solving skills, Anwar said. The key to the new track is the integration of the foundational elements of creativity and innovation into an engineering, technology and arts pilot program, Anwar said. Three new multidisciplinary courses and a new graduate certificate program will be developed by the School of Engineering and Technology at IUPUI. The IU School of Art and Design in Bloomington and the IU Ernestine M. Raclin School of the Arts in South Bend are collaborative partners in this project. These interdisciplinary courses will be team-taught by faculty from art/design, interactive sculpture, mechanical engineering and electrical engineering technology. The first course will focus on training the students in art/design with particular emphasis on origami and complex structures, promoting creative thinking with applications to engineering design through course projects. The second course will be a transitional course from static structures to mechatronic actuated/moving systems, connecting the art/design-oriented first course and the engineering/technology-oriented third course. The third course, focusing on environmental pollution and emission control, will allow the application of hands-on skills, knowledge and the creative design processes gained in the first two courses to solve real-world technical and engineering problems with the help of experiential learning. Students will have a chance to have an immersive experience in an industry or national lab setup, either through supervision by experienced mentors or direct placement as trainees at local industry/government labs. Experts believe that instilling creativity, innovation and hands-on experience into graduate engineering and other graduate STEM programs is needed if the U.S. is to keep its technological edge. The outcomes of this NSF-funded project are expected to be creative products such as new publications, invention disclosures and copyrighted materials as a result of the student work in the course projects, according to Anwar. “Because creativity and innovation are the driving forces for economic growth, it is critical to infuse innovative thinking and hands-on experience into the engineering and technology graduate programs,” Anwar said.